For the past two years I had a blank white wall, then a massive Bob Marley canvas (which I still love, and is currently sitting behind me), and now I’m loving my new gallery wall. My biggest thing with my office wall was trying to decide what to do with it. I had planned to frame and display designer shopping bags (that I’ve collected for years), but that would have cost a small fortune to frame each one to size. The other option was to turn it into a giant pin board or blackboard. In the end, with a little playing, I am happy with the end result. I use one corner of a huge office unit that is fitted around the room. I won’t show you the other side since it’s occupied by the hubz! While my setup is cute and girly, his is the complete opposite! I often call his side the “hacker corner” because it’s all dark and very techno-geeky! I spend most of my days here, so I wanted a space that was filled with pretty things. 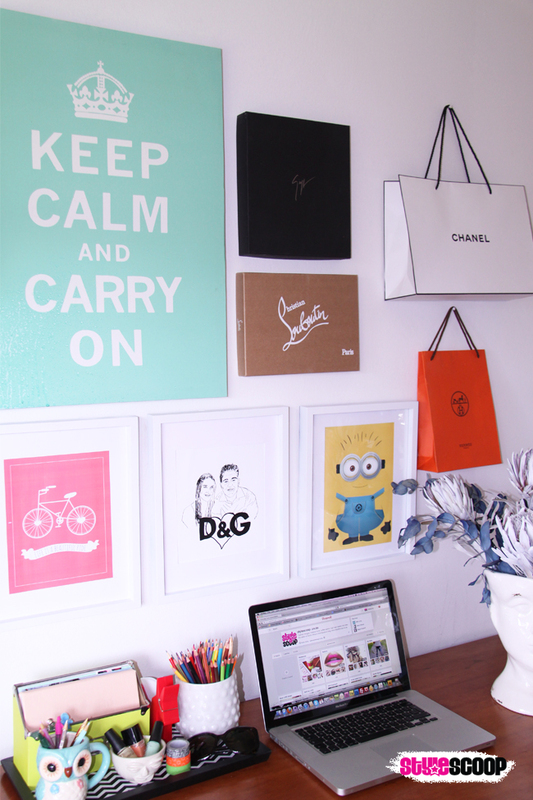 I’ve displayed a few shopping bags without frames, shoe box lids from my Zanotti’s and Loubies, my Keep Calm canvas (from my old office), some framed prints (don’t you just love my Minion? ), as well as a small string with pegged notes. 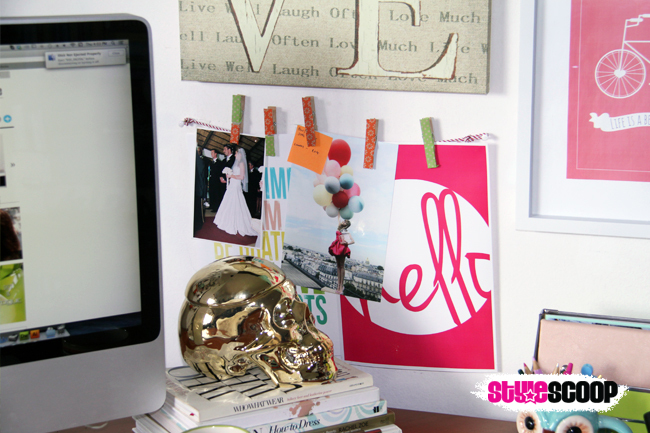 I turned ordinary bamboo pegs into cuter ones by covering them with washi tape – my new obsession! 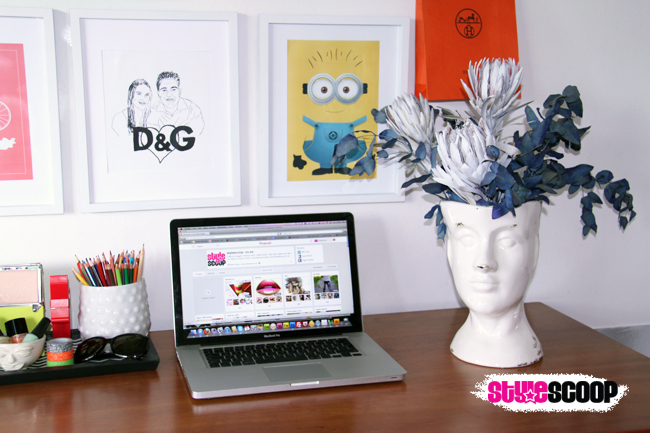 One of my favourite features on my office gallery wall is my cardboard stag head. I made him out of an old cardboard box, using this template and then just spray painted the whole thing with flat white spray paint. Not too shabby ehy? I really want to try this DIY out with a thin wood next. 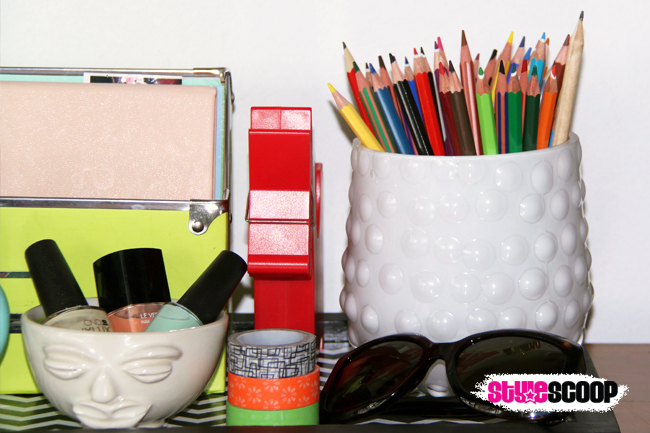 I keep all my stationary-things in this little black and white chevron tray – which was another DIY project over the holidays. I had an old icky board that I spray painted black and then printed out a black and white chevron print that I découpaged onto the wooden tray. Colouring-in pencils make me happy, even if they just serve as a display! Say hello to my little friends… My owl holds all my pens (yeah those are cool pens from Typo that look like pencils) and my face bowl is for little randoms – right now he’s holding a few of my current fave nail polishes. You can obvs. tell that I have an obsession with ceramic faces? I blame Jonathan Adler for that! I would die for one of his vases (especially this one), but I do love my face vase with my DIY Spray Painted Protea flowers. 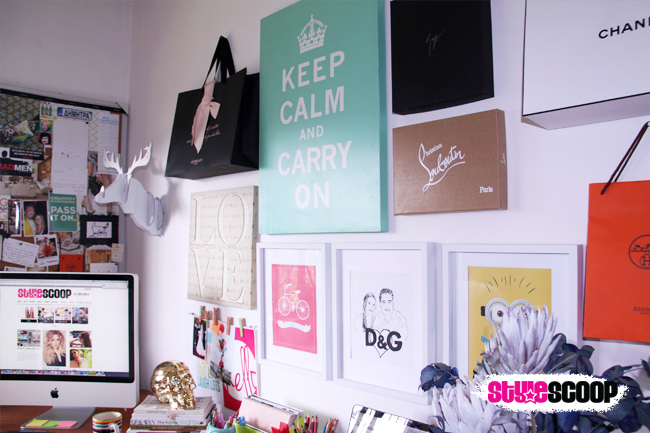 Ok, so here’s a nice overall look at my setup and my pretty gallery wall. I might add a few more frames to the top and right (which is not visible – but there is more space there), but we’ll see . One option I had was to frame black and white photographs of some of my fashion icons and have them at the top “watching over me” – Ha! Yet, another face! 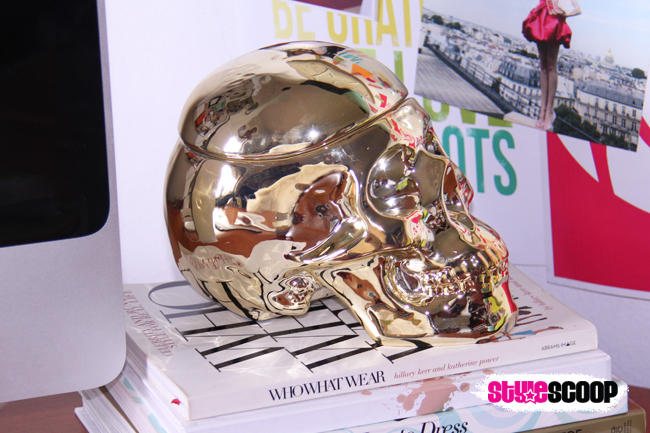 This gold skull is the bomb! I bought one that’s almost identical (but a money box) not too long ago. Then, I spotted this guy at Typo and had to have him as well! His name is Ray! He’s kinda freaky – in a Hannibal Lecter kinda way… remember the scene where HL slices just the top of Ray Liotta’s head and makes him eat his own brain…? Freaky! Anyway, my “Ray” is also freaky, but he serves a purpose as well. He’s my brain box and keeps all my memory cards, USB sticks, camera batteries and that sort of thing.